A mother’s love is infallible. She cares for her home with the utmost care without neglecting a thing. The source of this maternal love is undoubtedly God the Mother. 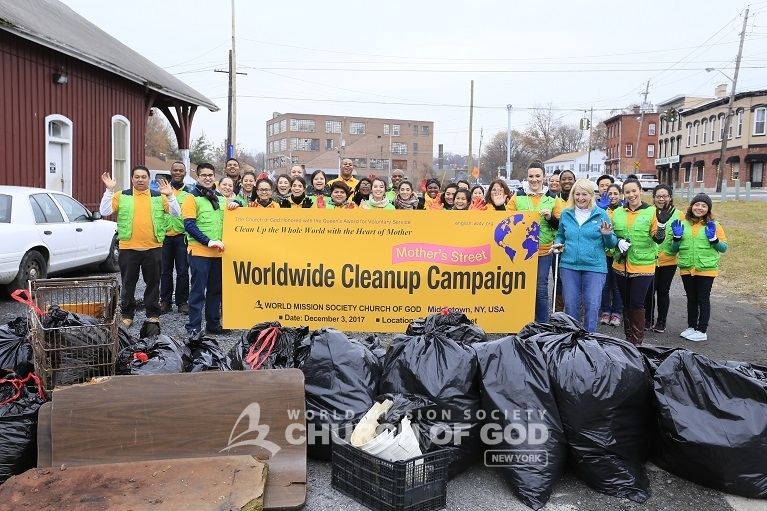 Following the example of Heavenly Mother, the members of the Church of God decided to carry out the “Mother’s Street” cleanup movement. The campaign spanned over a period of two weeks—from November 19 to December 3. The volunteers went out with the intention of bringing about a sense of health and happiness to their neighbors. 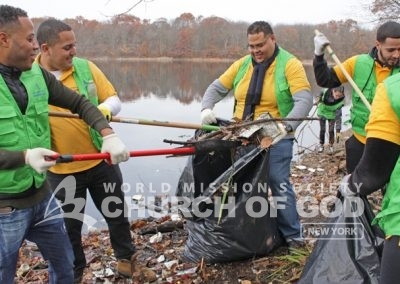 Churches of God in Albany, the Bronx, Buffalo, Long Island, New Windsor, Rochester and Syracuse each carried out a cleanup event in their own local streets and parks. Furthermore, the movement took place on a global scale, with volunteer participation in more than 6,000 regions across the world. 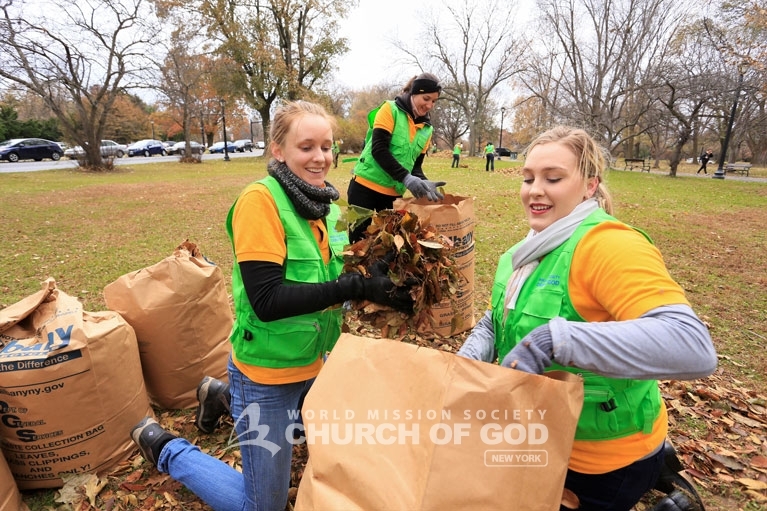 As a result of the unity, the Church of God accomplished the goal of cleaning a distance of 25,000 miles—equivalent to the circumference of the earth. 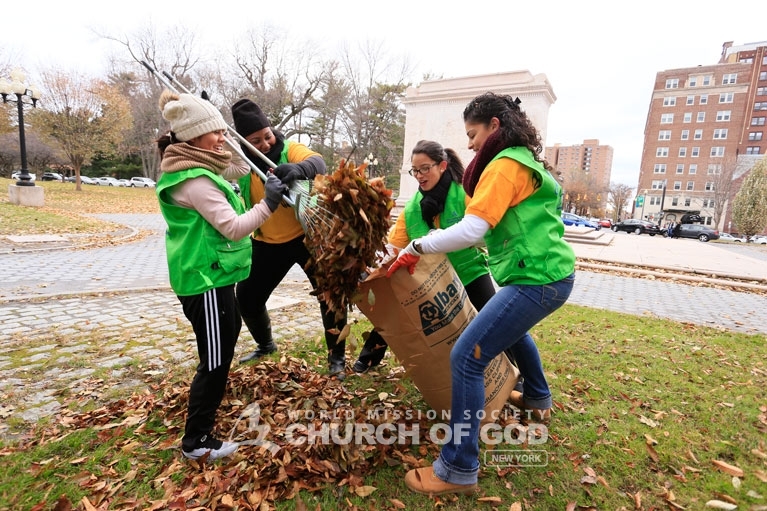 Church of God volunteers participated in "Mother's Street" by picking up leaves at Washington Park in Albany. Members wasted no time raking leaves at Washington Park in Albany as part of the global "Mother's Street" movement. 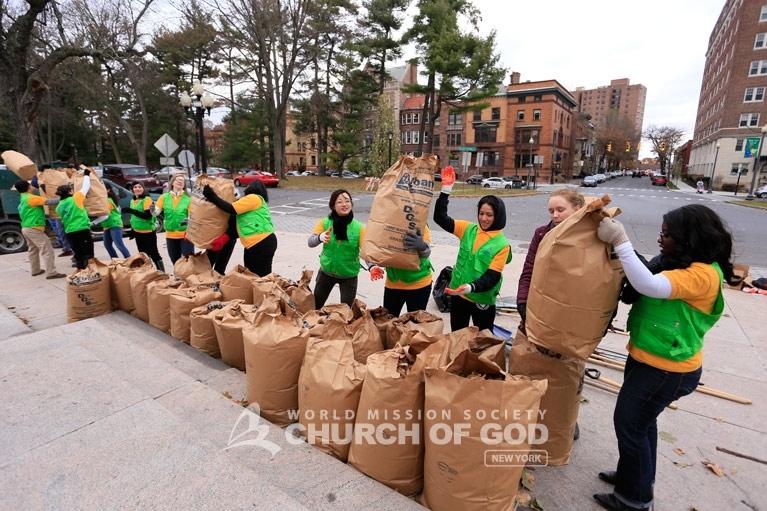 With great enthusiasm, Church volunteers bagged up leaves to clean up Washington Park in Albany. Volunteers filled bags by the dozens at Washington Park in Albany for the "Mother's Street" cleanup campaign. 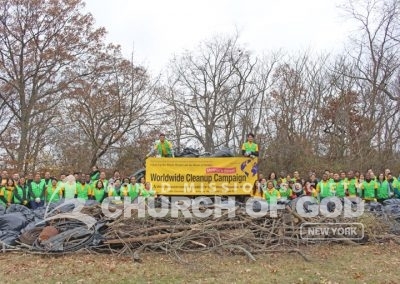 Wearing their yellow t-shirts and bright green vests with rakes, brooms and garbage bags in hand, volunteers were ready to tidy up their communities. In the Bronx, over 100 members gathered early in the morning to give Webster Street a makeover. All the volunteers worked together collecting wrappers, leaves, tires, and debris which filled a total of 247 garbage bags. Moreover, volunteers diligently made the streets clean, completing the total distance of 1.7 miles. 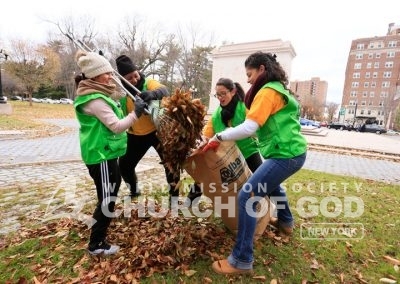 “The members are moved and thrived to clean the streets with the heart of a Mother, just as a Mother cares for the house day after day, caring for her children” said Victor Lozada, a volunteer of the Church of God. News 12 interviewing a volunteer from the World Mission Society Church of God in the Bronx. Volunteers cleaned up leaves and trash in unity to fulfill their "Mother's Street" initiative. 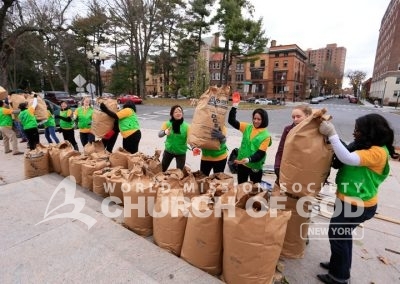 In the Bronx, Church members were all smiles as they cleaned up the streets with the heart of Heavenly Mother. 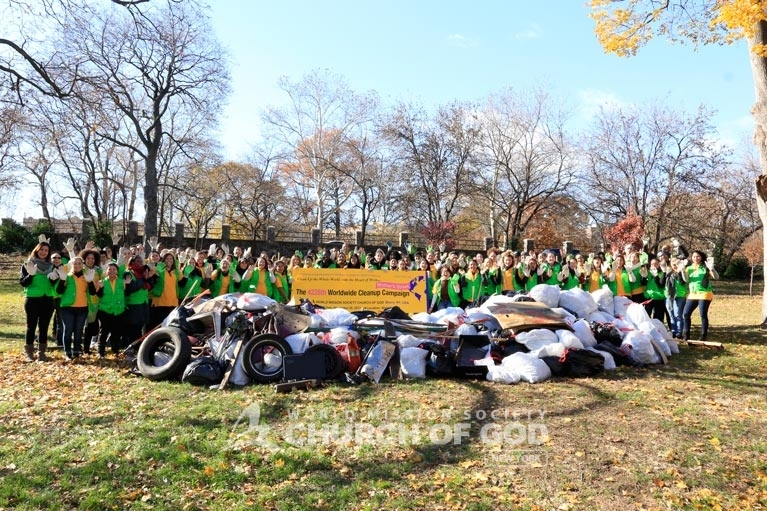 Group photo of Church of God volunteers and the trash they collected through the "Mother's Street" cleanup in the Bronx. A cleanup was held at Hempstead Lake State Park in Long Island as well. About 90 members filled approximately 240 garbage bags, using rakes, pickers, shovels and gloves. Everyone worked together up and down the shoreline of the lake, cleaning up a total distance of 1 mile. 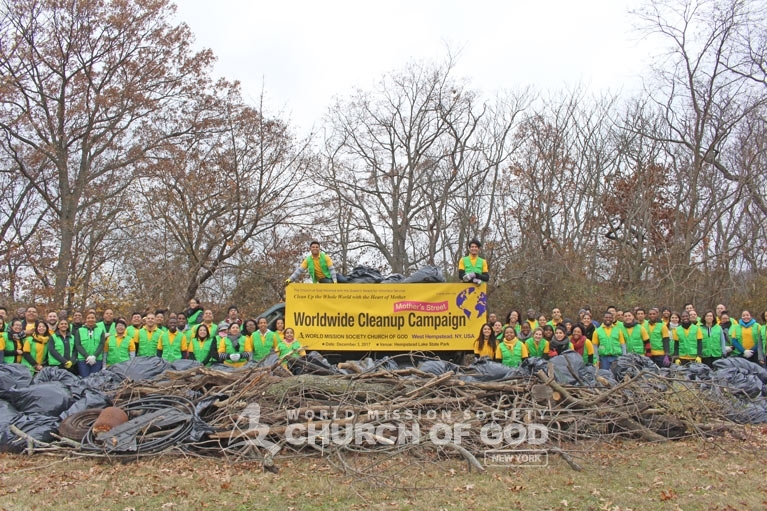 Group photo of Church of God volunteers after they finished carrying out the "Mother's Street" cleanup movement in Long Island, NY. 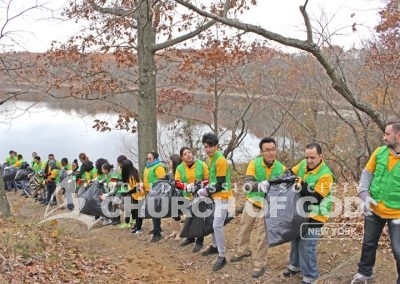 Church of God volunteers worked together to haul away dozens of bags of trash at Hempstead Lake State Park. At Hempstead Lake State Park, volunteers collected all kinds of trash for the "Mother's Street" cleanup campaign. 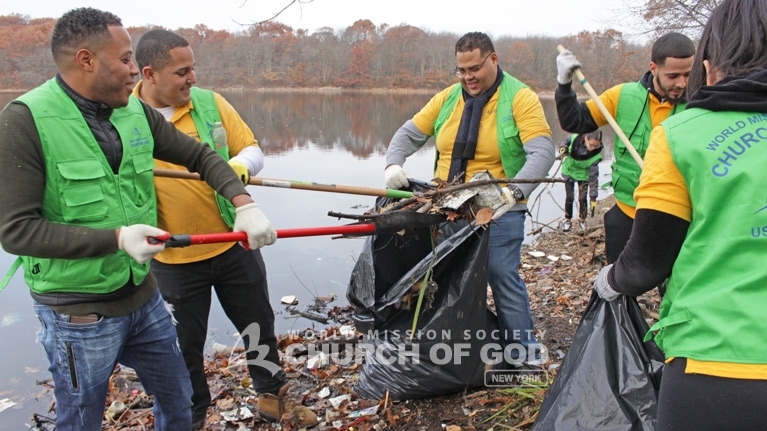 Church members used all their strength to clean up Hempstead Lake State Park in Long Island with a mother's love. 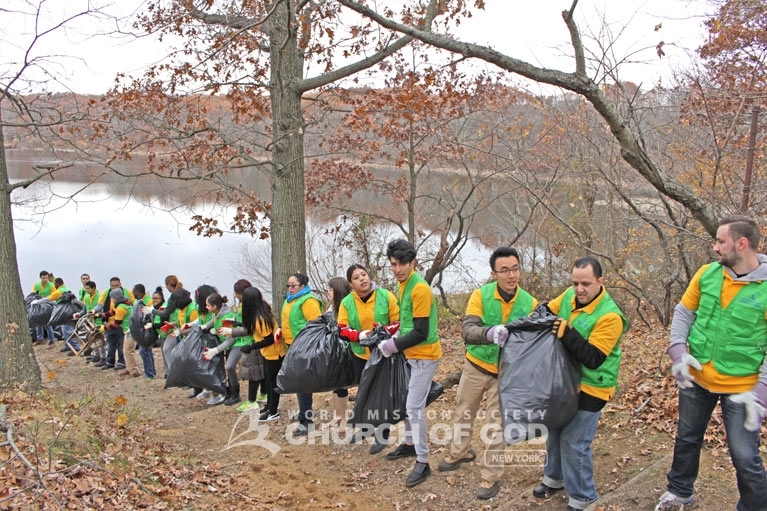 With pickers in hand, Church of God members removed trash from the water at Hempstead Lake State Park. Volunteers got down and dirty to pick up garbage and litter during the "Mother's Street" cleanup at Hempstead Lake State Park. Members of the Church of God feel rewarded to have spread such amazing energy and joy to their neighbors. If you are interested in learning how you can help your community with the Church of God, send us an email through our Contact Us page. Check out “Mother’s Street” in the news! It’s awesome!! “Mother’s Street” Cleanup Movement!! All participants look happy and joyful. Way to go, WMSCOG!! Amazing event! I love everything the World Mission Society Church of God participates in, in order to make the world a better place! Being part of it was even more amazing! I recommend everyone to this awesome Church!